The last couple of years have been a busy and exciting time for Metavate with a number of new plant installations all over the UK. One of the highlights was the design and installation of a brand new pretreatment plant and reformatting of some existing Plant for Eaton Power Quality and Electronics Division (Cooper 8-Line Ltd.) to enable them to take advantage of Metavate’s exclusive Plaforization system. Eaton, based in Highbridge, Somerset, has over 50 years of experience in providing engineered solutions for commercial and whitespace datacam applications. Eaton is a global diversified power management company that helps customers worldwide manage the power needed for buildings, aircraft, trucks, cars, machinery and businesses, including developing and manufacturing innovative technologies for Data Centre Enclosures and Power Management within them. Eaton required a complete overhaul of their ageing degreasing and phosphating process in order to reduce the size of their plant, cut costs, improve corrosion resistance and minimise their environmental impact. By adopting Metavate’s unique Plaforization process they have achieved these goals and more. Toran 3 proved to be the ideal product for Eaton from Metavate’s range as it is specifically designed for customers who powder coat their products, providing up to and beyond 1000 hours of salt-spray corrosion proofing. Independent Laboratory tests showed Eaton obtaining over 1500 hours of salt-spray protection. Metavate designed and installed a large EcoJet batch processor to apply our Toran 3 product and enable high throughput capacity. They also relocated and reconfigured the existing conveyor and box oven. 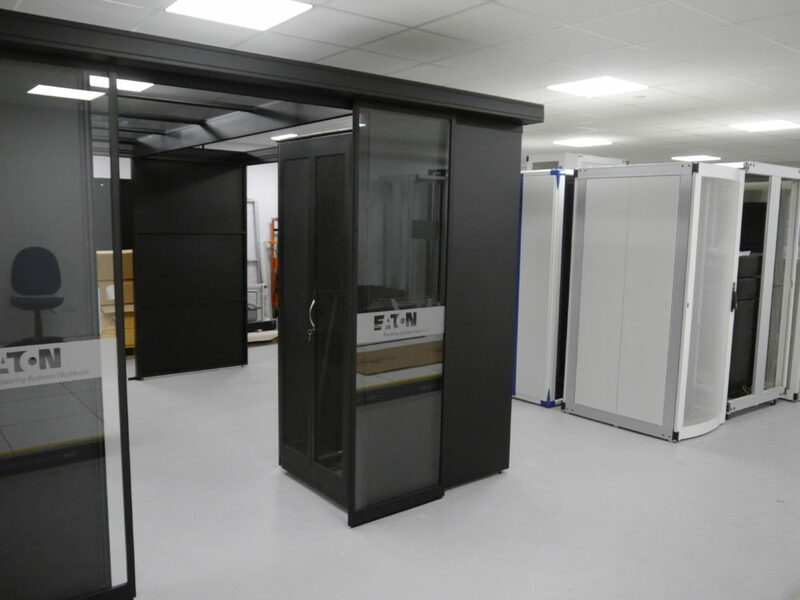 They supplied an Airflow in-line cure oven while Eaton organised the relocation of their existing up-to-date Gema powder booth and filtration system. Eaton’s Highbridge operation is their UK rack design centre and they expected limited runs of “specials” together with their development work but they have experienced for higher levels of demand than anticipated and they are flat out all of the time. The stand-alone batch processor “EcoJet” Toran 3 pre-treatment unit easily handles the required demand and versatility. It is always ready-to go with no heating and no waste to manage, no titration or other management or cleaning. Toran 3 is not a VOC and there ore no harmful emissions. Toran 3 degreases and polymer coats all metals in one simple, heat-free step.